Arich's Ambush is the boss level of Kremwood Forest, the second world of Donkey Kong Country 3: Dixie Kong's Double Trouble! The Kongs must take down Arich in order to obtain a patch necessary to repair the Hover Craft and access Cotton-Top Cove and Mekanos. The fight takes place in between two trees in a forest area. A branch from each tree connects with one another to form the bottom of the battle arena. There is a short, thin branch on each side which serve as semi-permeable platforms, as well as a thicker, cutoff branch on the upper-right. The Kongs emerge at the bottom-right corner. If the player has only one Kong coming into this level, the other Kong will automatically spawn from a DK Barrel. At the start of the battle, Arich will start slowly bouncing up and down while hanging by a thread. His bouncing speed increases with the amount of hits he has taken. If the Kongs touch the bottom of his legs, they'll get hurt, but if they land on top of them, they bounce off harmlessly. To damage Arich, the Kongs must get on his back and grab the barrel on it, then hit him in the jaw with it. After using the first barrel, all remaining barrels will spawn on the cutoff branch, which can be reached by riding on Arich's back. Any time the Kongs are on the cutoff branch, Arich will rise upward and spit venom balls at them until they get off. After hitting Arich a second time, he will spit three venom balls toward the ground, then resume bouncing. Once the Kongs have another barrel, he will repeat this attack; the venom balls will destroy the barrel if they collide with it. 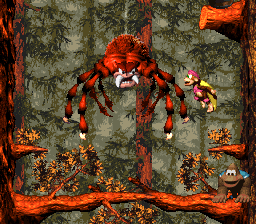 Avoiding them allows the Kongs to hit Arich a third time, which prompts him to spit five venom balls, which bounce off the tree branches until they fly off the top of the screen. He repeats this after the Kongs get another barrel. One more hit defeats Arich, causing him to drop a patch. If the Kongs return to this stage after completing it and beat Arich again, they are rewarded with a Bear Coin instead. In the Game Boy Advance version, the battle arena was made smaller to accomodate for the GBA's smaller screen, and Arich doesn't bounce as high. It is now possible for Arich's venom balls to bounce off of the tips of the small branches on each side of the arena. Other than that, the fight is the same. This page was last edited on January 22, 2019, at 23:54.